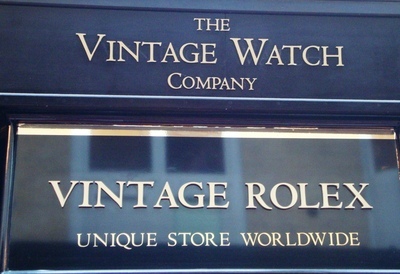 I recently learned that the Burlington Arcade has been acquired by two multinational companies, who wish to change the entire ethos of this unique shopping area. This would be a terrible shame as it would then become another, if smaller, version of nearby Bond Street. We need to retain areas of historical interest and individuality, and if you visit the Burlington Arcade you'll soon realise why it shouldn't be changed. The arcade is the world's first covered shopping area, technically a mini shopping mall. It was created by Lord Cavendish, and designed by Samuel Ware, to stop ruffians throwing rubbish (especially oyster shells) onto the Lord's property. It was opened on 20 March 1819 at a reputed cost of £49,000. The original 47 leaseholders included six women, but all the shopkeepers were designated 'Madame'. These trades people paid £12.2.3d annual rent for a single shop unit. 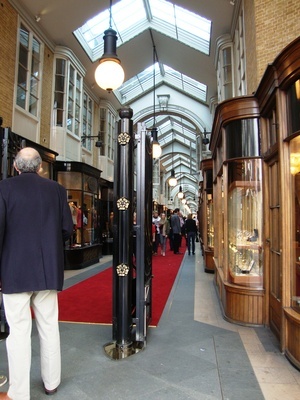 The Burlington Arcade still retains an air of the nineteenth century, and it would be easy to believe that the existing businesses have all been there since 1819. It is policed by the traditional Beadles, who uphold the rules, and regulations that stipulate there is to be no whistling, singing, playing of musical instruments, running, carrying large parcels, opening of umbrellas, and no babies' prams. The Beadles are distinctive in their Edwardian frock coats and gold braided top hats and were originally recruited from the 10th Hussars, Lord Cavendish's family regiment. 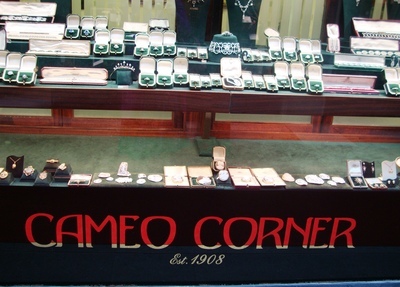 including goldsmiths, silversmiths and antique watch sellers. There are also several knitwear and leather goods retailers, and a resident shoe shiner. However the range of businesses is starting to change as upmarket designer labels are already becoming established in the arcade. 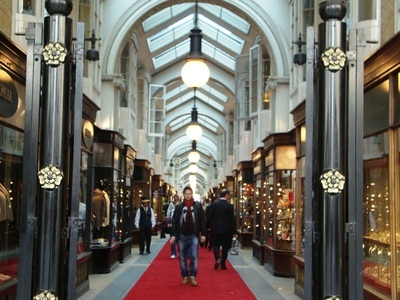 Please do visit the Burlington Arcade, which can be found running between Piccadilly and Burlington Gardens, offer your support, and even contact Westminster Council to stress how much you would prefer for the arcade to retain its individuality. 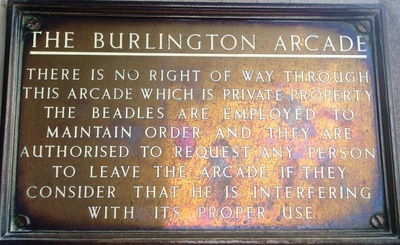 I'm not advocating a return to two hundred years ago when many of the shopkeepers lived above or below their premises, but please offer your support for the retention of the Burlington Arcade's original character. How many other shopping areas roll out the red carpet for their customers?